WEIGHT OF ATHLETES The two contenders of each team will be weighed. This procedure will be used by the managers, and then matched, taking into account the smallest weight difference. Ex. 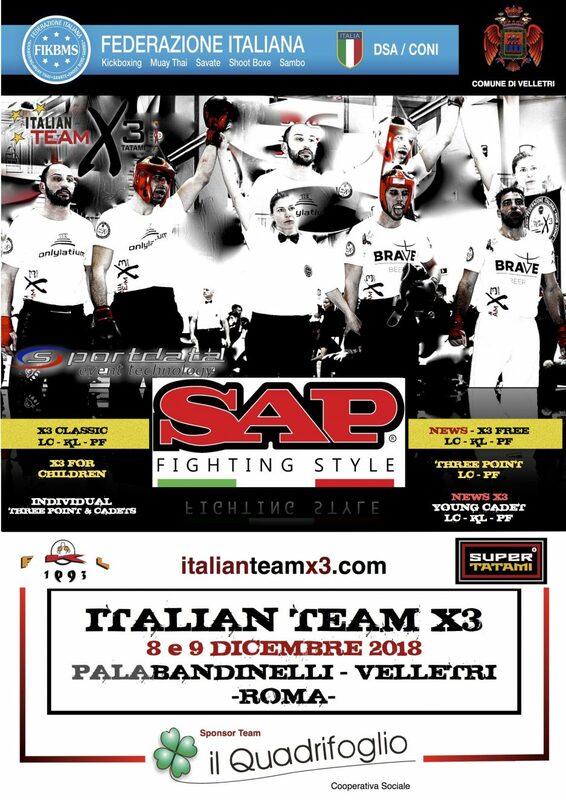 Team up to 69 kg Team PND on the scale: Lorenzo Bracchi 63 Kg and Chianese Andrea 69 kg EuroKickBoxing Team on the scale: Gianni Loverso 59 Kg and Attilio Borghi 65 kg In this case Lorenzo Bracchi (63 kg team PND) will fight against Gianni Loverso (59 kg team Eurokickboxing) and of course Andrea Chianese 69 kg against Attilio Borghi 65 kg. In this way, it will be difficult to reach an excessive weight difference and even the athletes, who will not find themselves in optimal weight, will be more relaxed. RACE REGULATION TWO Coaches are allowed on the corner. Once the two teams are confronted, the fight will begin. Practically we start with the two lighter contender. The first couple fights for ONE MINUTE, under the heading "CHANGE", quickly and without interruptions, the second pair will start, always for ONE MINUTE. Each pair of contenders will make 3 ROUNDs for ONE MINUTE (just the name x3). ACCIDENT: in the event of an athlete's "injury", the match will proceed with the remaining athlete, who will have to take all the remaining rounds to be played. In the past, similar things have happened and the matches, instead of losing interest, were "explosive", especially when the athlete remained, he managed to keep up with the two contenders, who regularly alternated with the change. In support of the classic three referees of the chair (or standing for the Point Fight), there will be a spectacular "megascreen" on each tatami of the race, on which it will appear in real time, the score of the two teams (clearly visible to all, public included). Obviously, the score will never be reset during the match. The team will win, which will score the most points. The race boards will be identical to the individual standard matches. ITALIAN TEAM X3 TATAMI, has always been distinguished by the strong  CASH PRIZE, delivered to the FIRST classified TEAM. Also in this 2nd international edition, open to all weight categories and age groups, it remains the will to reward each TEAM that will win the PODIUM (FIRST CLASSIFIED), with ASSIGN / CASH of € 300.00 (only BLU / BLACK Jun / Sen. Masculine and Feminine), for all three styles: Light, Kick Light and Point Fight. - An absolute novelty in the field of tatami sports, a formula tested successfully since 2005, through international PRO-performance meetings (always with the best athletes in the world). Easy sponsorship of the teams. Greater involvement of athletes and the public. The possibility is better to make the meetings spectacular. A "dedicated facebook" page (italian team x3 tatami) is already active, on which will appear from time to time "news" useful for all those who want to participate.